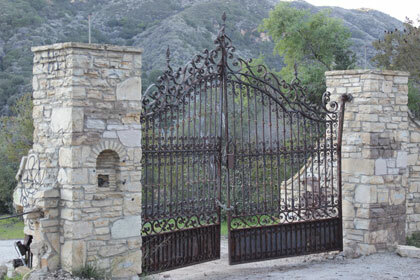 Rustic Canyon: home to sprawling mansions, Hollywood royalty and – hidden in the lush thicket – the ruins of a WWII fortress. And you can hike to it. Introducing the Murphy Ranch hike, a lesser-known and innocuously named trek into the mad, mid-century rubble of Norman and Winona Stephens, who – at the behest of a German spy – began building a staging base for the Vaterland in the ‘30s. What’s left today? The haunting, graffiti-tagged remains of their coal-fired plant. Damaged cisterns. Industrial ruins. To hike what’s left, take Will Rogers State Park onto Sullivan Fire Road, which is also accessible at the end of Capri Drive. Follow that to a large stone and wrought-iron gate. Pass through and follow the stairs down. As you descend through the foliage you’ll see the 37,000 gallon water tank. At the bottom: the ruins. Take a left to climb the perilously steep steps 200 feet back up to the fire road. The owners intended to build a four-story mansion, but they were (thankfully) arrested the day after Pearl Harbor. The city plans to replace the buildings with a picnic area. So get there fast, before it’s history.